Click on a highlighted State to go to that State's Improve EHDI website. Welcome to the Early Hearing Detection and Intervention (EHDI) quality improvement websites. Here you will find links to the participating states' individual sites. Each site contains a variety of information specific to the topics of Medical Home, Inpatient Screening, Outpatient Screening, Pediatric Audiology, Early Intervention, Specialty Care and each state's EHDI program. Sites are designed to provide best practices, tools for improvement and examples of Quality Improvement in action in the EHDI system. You can also find contact information for each state's EHDI program if you are interested in speaking directly with that state's EHDI team. 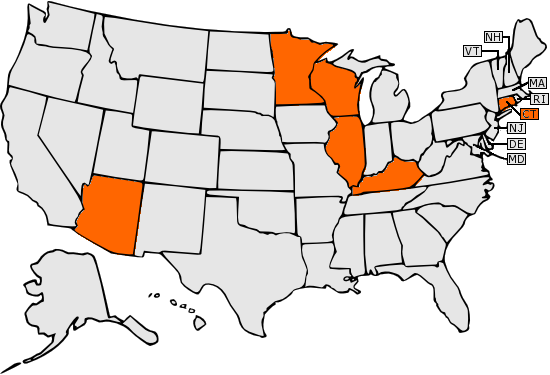 Click on the highlighted state or on the participating state listed below to get started.